There are several of these short, single span, half-hipped Pratt pony truss bridges over creeks in Nevada County. 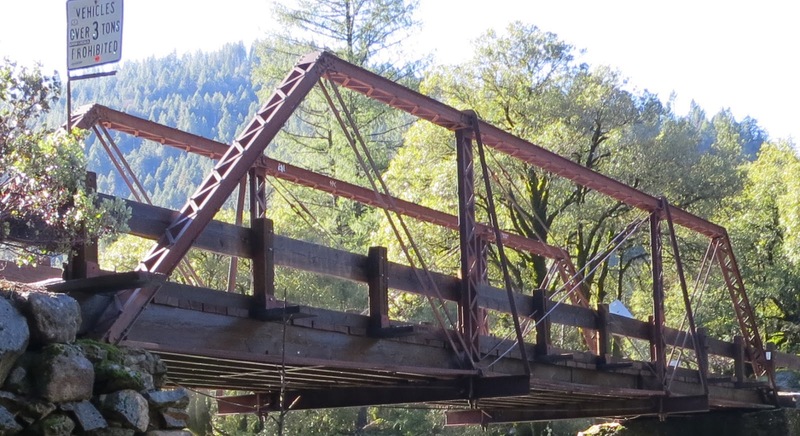 Getting to this bridge required a drive through deep snow east of Nevada City (on State Route 20) and then down Maybert Road through the town of Washington in what was once gold country. The bridge crosses Canyon Creek just before it flows over a dam into the South Fork of the Yuba River. The Maybert Road Bridge was built in 1915 according to the Bridgehunter (my copy of 'Historic Highway Bridges of California' gives the date as 1895). It's structurally deficient (scoring 5.0 out of 100 during the last inspection). If it ever had a steel railing it's long gone. Timber stringers are supported by steel floor beams that extend past the deck and are attached to diagonal tension members and latticed, vertical members. The bridge is scheduled for replacement in 2014. Average daily traffic is 100 vehicles, which justifies the construction cost of $400,000 or about $200 per square foot. Based on the evidence in the Bridgehunter's blog, 1895 seems like a more reasonable date since a plaque near the bridge says the town of Ormonde was established there in 1887 (and the town of Maybeck a few years before) but all the mining settlements were abandoned by 1897. Perhaps the original bridge was built in 1895 and a replacement was set on the same abutments in 1915? This was the furthest upstream along the South Yuba River where there was mining and it yielded $17 million in gold before it was played out. 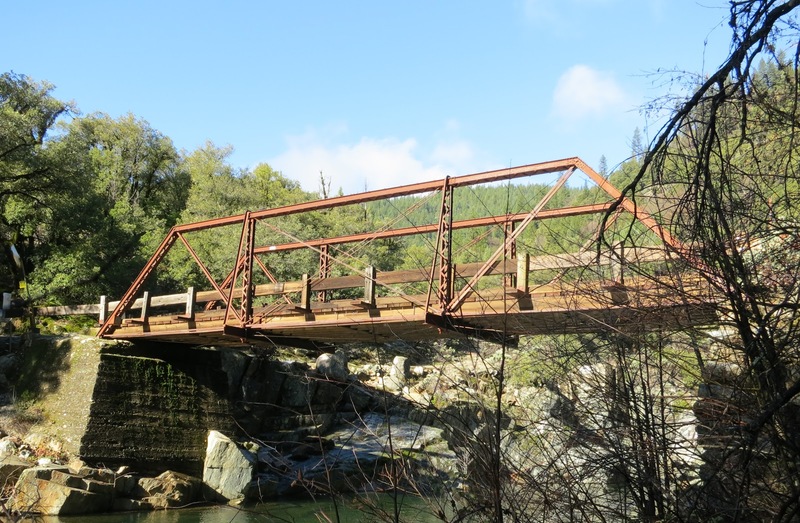 Nevada County, California's Bridges: Maybert Road over Canyon Creek by Mark Yashinsky is licensed under a Creative Commons Attribution-NonCommercial-ShareAlike 3.0 License.